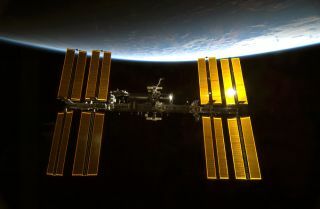 Astronauts on the International Space Station have discovered a leak of ammonia coolant on their orbiting habitat, and NASA is looking into the problem, though it poses no immediate danger to the crew, officials said today (May 9). The space station uses chilled liquid ammonia to cool down the power systems on its eight giant solar array panels. A minor leak of this ammonia was first noticed in 2007, and NASA has been studying the issue ever since. In November 2012 two astronauts took a spacewalk to fix the problem, rewiring some coolant lines and installing a spare radiator due to fears the original radiator was damaged by a micrometeorite impact. "It is in the same area, but we don't know whether it's the same leak," NASA spokesman Kelly Humphries of the Johnson Space Center in Houston told SPACE.com. Humphries said the agency was taking the leak seriously because it affects an important system — if they lose the ability to cool that particular solar array, it won't be able to generate power for the station. In fact, the leak has worsened to the point that Mission Control expects that particular loop to shut down within the next 24 hours. However, "the crew is in no danger," Humphries stressed. It's too soon to speculate on a possible spacewalk or other measure to deal with the issue, he added. Mission Control has been discussing the problem with the astronauts on the station throughout the afternoon. "What you guys have provided in the way of imagery and video has been just like gold to us on the ground," astronaut Doug Wheelock from Mission Control radioed to space station commander Chris Hadfield, a Canadian Space Agency astronaut. "We are fairly confident that it's coming from the vicinity of the TCS." However, flight contollers noted they were still unable to pinpoint the leak's exact location. NASA engineers are reviewing plans to potentially move the station's robotic arm over to the area of the port truss, the scaffolding-like backbone of the station (the original leak was traced to the Port 6 truss). "Tomorrow we'll plan to get the arm in the game to see if we can better pinpoint the location of the leak," Wheelock said. Hadfield said he and his crewmates had noticed the rate of the leak varied depending on the orientation of the station with the sun, suggesting particular angles allowed the ammonia coolant to leak more quickly. Hadfield is in charge of the station's Expedition 35 crew, which also includes NASA astronauts Tom Marshburn and Chris Cassidy, and Russian cosmonauts Roman Romanenko, Pavel Vinogradov, and Alexander Misurkin. He asked Mission Control to send the crew a summary of what they know about the problem, and the possible courses to take to address it, before their bedtime. "It would just be good for the six of us to know," Hadfield said. Today had otherwise been a relatively light day for the crew of the International Space Station, which had taken some time off to celebrate the Russian holiday Victory Day. Hadfield, Marshburn and Romanenko are due to depart the space station on Monday (May 13) to return to Earth after a roughly five-month stay. Three new crewmembers plan to launch on May 28 from Kazakhstan on a Russian spacecraft to take up residence on the orbiting outpost. Hadfield asked Wheelock if the leak, and resulting power loss from that solar array, could delay his planned undocking. "We don't see anything technically that we can't overcome with the undocking but we are still getting our arms fully around that issue," Wheelock responded, adding that they should have more information for the astronauts in the morning.